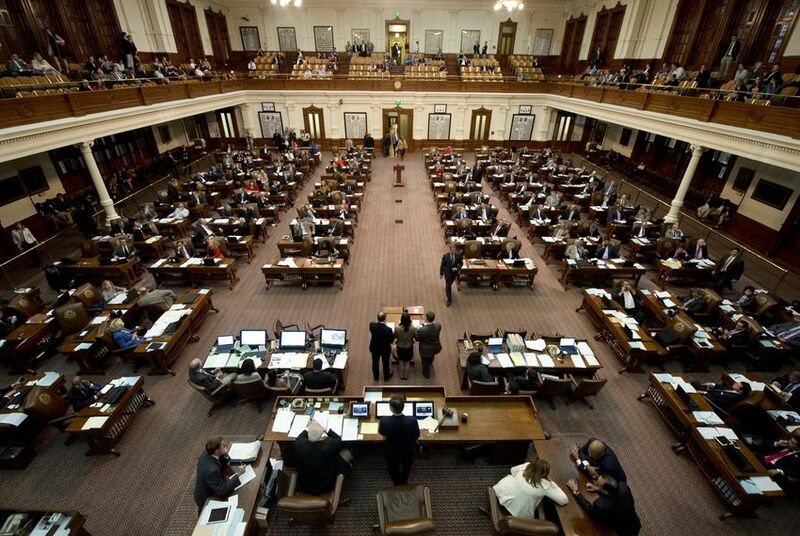 Only four members of the Texas House have filed papers declaring their candidacies for speaker. But the election isn't until January, and many more candidates are lurking in the shadows. *This column has been updated throughout. Only four people have declared themselves candidates for speaker of the Texas House of Representatives, but don’t get the idea that you’ve seen the full field of candidates. The election won’t actually happen until January, when the Legislature convenes for its next regular session, but the politics are well underway. The four officially and legally in the race to succeed current Speaker Joe Straus, listed in the order they jumped in, are Reps. Phil King of Weatherford, John Zerwas of Richmond and Tan Parker of Flower Mound, all Republicans, and Eric Johnson, a Democrat who got in Wednesday morning. They have filed papers with the Texas Ethics Commission declaring their candidacies, which is what you’re supposed to do before you start politicking — spending money on travel and meals and such while you run around talking to the other members of the House about becoming the next speaker. Compared with other political races, it’s not particularly expensive to run for speaker of the Texas House. Successful candidates usually travel to members’ districts, talking to them at home, sussing out their feelings about what they want to get done as legislators, how the next speaker can help them, what roles they want to serve and so on. Relationships often trump politics. Legislators vote for leaders they’re comfortable with, people they believe will either help them get things done or at least stay out of their way and let them work. They hardly ever vote for people who’ll boss them around or take them for granted. This is a very personal kind of politics. Given that, the normal signs of political activity — advertising, big spending, debates — aren’t in play in a race for speaker. Outside groups will advertise and try to raise money around the contest, hoping to get their own champion on the House dais next January. But the big spending in regular campaigns is on ads, which aren’t of any use to speaker candidates. Debates? The members of the House want one-on-one sessions with the candidates — not big, showy forums. The process plays, like the running conversation over whether the House’s Republican Caucus should pick a speaker from its membership and then vote as a bloc, have been getting more attention than the candidates. That’ll change as the race quickens and as more candidates come out of the shadows. Don’t expect all of them to run. It depends on what their colleague/voters tell them. And don’t expect this to be a complete list for a contest that is still developing — and one in which some of the small pool of voters won’t be chosen until November. The last open race for a Texas speaker was in the months preceding the Legislature’s 1993 session. It was triggered, like this one, by a five-term incumbent’s decision to give up the post. Unlike Straus, that speaker — Gib Lewis, D-Fort Worth — left under an ethical cloud and under some pressure to move on. That gave legislators a reason for change; one of Pete Laney’s selling points was that he would give the House an ethical scrubbing and clean up its reputation. The Hale Center Democrat served for five terms, until the Democrats lost their majority in the 2002 elections. Tom Craddick, R-Midland, rode that Republican majority (with a critical handful of Democratic votes) to become speaker, holding the job until Straus defeated him in 2009 — an overthrow fueled by Craddick’s perceived top-down management style. It’s not clear what the average House member hopes for now that Straus is retiring. Unlike his most recent predecessors, he’s leaving the office of his own volition. There’s no obvious call for a replacement with any particular characteristics, which is one reason such a wide variety of names are in the hat. The House has eight months to sort them out.